Posh players celebrate Jack Payne's goal at Sheffield United in front of their own fans. Photo: Joe Dent/theposh.com. My word this management lark is easy. It’s two wins from two games against promotion-chasing sides for Peterborough United’s caretaker-manager Dave Robertson. Much more of this and he could save chairman Darragh MacAnthony the time and expense of finding a more experienced full-time boss - he’s also making his owner look like an employment genius, although the ‘Negative Nellies’ on social media are already cursing him for not shedding Darren Ferguson and his coaching crew a couple of months earlier. There is no doubt that MacAnthony’s night of the long knives in which six staff members were ruthlessly despatched has also purged Posh of negative thinking, baffling selections and substitutions, midfield diamonds and professional pea-hearts. They’ve all been consigned to room 101 and been replaced by the positive force that is Robertson, assisted by club legends Grant McCann and Aaron Mclean. It’s not unfair to say that Robertson wasn’t the club’s first-choice to replace Ferguson a fortnight ago, but he’s already leapt to the forefont of the mind of any sensible thinker. Robertson is so well prepared he’s quickly become fluent in managerial lingo as he peppered his post-match press conference, following last night’s (March 3) thrillingly late come-from-behind 2-1 win at Sheffield United, with phrases like ‘feelgood factor;, ‘Roy of the Rovers’ and ‘12 Cup Finals to go’. He’s also thrilled with the apparent headache he’s given MacAnthony, who incidentally returns to the UK in time for Saturday’s (March 7) home game with Leyton Orient. The chairman intends to start the candidate selection and interview process, but if Posh move into the play-off places at the weekend - and that’s not that unlikely an outcome - MacAnthony might well be picking from a short list of one. Wins at places like Bramall Lane in such dramatic fashion are the perfect job interview. Actions speak louder than words and the response of the players to the misfortune of falling behind midway through the second-half following a horrible defensive blunder proved who they are backing for the job. Posh have still lost more games than they have won in League One this season, but this is one crazy competition. At approximately 9.10pm last night Posh were 1-0 down and 16th in the table, but by 9.15 they were 2-1 ahead and eighth before settling for the night in ninth spot thanks to those unreliable sorts at MK Dons. Captain Jack Payne from 25 yards and substitute Conor Washington with an explosive finish of his own helped deliver four fabulous minutes in the final stages at Bramall Lane - a ground where Posh hadn’t previously scored a Football League goal, never mind won a game. Robertson had named the same starting line-up for his second match in charge. He wasn’t up for containment against a highly-rated Blades outfit and his approach worked once a few nervy opening moments had passed. Robertson also stayed positive after Payne’s 87th-minute equaliser after sensing that home manager Nigel Clough’s natural negativity had inflicted his players. His reward was Washington pouncing on fellow substitute Mclean’s headed flick, surging past two ineffectual attempted tackles and firing a superbly struck finish across Blades’ keeper Iain Turner in the first minute of added time. Once Michael Doyle’s last-gasp chance from a corner had flicked the top of the crossbar some splendid celebrations could begin. And the huddles, the embraces and the fist-thumping in the direction of some more outstanding away support (417 comfortably out-performed 18,000 rivals even when their team was behind) seems wonderfully genuine. The transformation in team spirit as well as tactical prowess in just 10 days is quite stunning. Posh had to survive a nervy start when ‘keeper Ben Alnwick was forced to tip over Mark McNulty’s 20-yard drive and keep out a Jamie Murphy effort with his foot in the first 15 minutes, but once Payne and Michael Bostwick started to close the midfield gaps, Posh often looked the better side without assuming complete control. Bostwick was immense, thundering into tackles and always emerging with the ball. He dominated former Posh midfielder Paul Coutts so completely he was withdrawn at half-time. Under Ferguson Bostwick looked technically deficient in the centre of the park, but he was a monster last night. Teenage centre-back Ricardo Santos has been Robertson’s other selection gamble and he too has paid off, although his team-mates got him out of trouble last night with their late, late show, Midway through the second-half Santos ignored the ‘Zakuani’ option of clearing into touch or passing back to the ‘keeper in favour of pretending to be Franz Beckenbauer. He was caught in possession by Matty Done and although Alnwick made a fine save to thwart the home striker’s first attempt at goal, he was powerless to keep out the follow-up header. 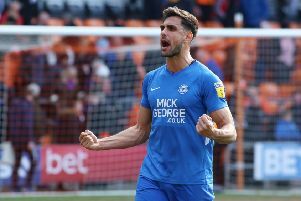 Posh may well folded after such misfortune a couple of weeks ago, but Payne struck the outside of a post from distance and Joe Newell dithered so long after accepting Jon Taylor’s outstanding cross his shot was blocked before goals were delivered and a first Tuesday win of the season (at the seventh attempt) was confirmed. Santos played well either side of his error again and there were strong defensive displays from the immaculate Zakuani and two full-backs Michael Smith and Kgosi Nthle who were up against two talented wide players. Newell was terrific throughout, often on the right wing. He played a couple of cute passes in the first-half, one that freed Kyle Vassell who ruined the moment by dithering and eventually shooting into the side-netting from an impossible scoring angle, and another that saw Luke James denied by an excellent block tackle. James and Vassell remain the biggest concerns in Robertson’s favoured XI. Vassell found space well, but delivered a series of weak or off-target shots, while James, who received no protection from the officials, was marked out of the game completely. It has to be said that the home side were disappointing. They played with little tempo, putting together just one quality move all game which finished with Done just failing to reach a Bob Harris cross midway through the first-half. They also received no obvious support from their sizeable crowd who were strangely mute all night until booing their side from the field. Lack of positive support is not something Posh and Robertson are likely experience in the final push for the play-offs. Posh: Ben Alnwick, Michael Smith, Kgosi Nthle, Gaby Zakuani, Ricardo Santos, Jack Payne, Michael Bostwick, Jon Taylor, Joe Newell, Kyle Vassell (sub Conor Washington, 56 mins), Luke James (sub Aaron Mclean, 79 mins). Unused substitutes: Dion-Curtis Henry, Harry Anderson, Christian Burgess, David Norris, Harry Beautyman. Sheffield United: Iain Turner, John Brayford, Jay McEveley. Chris Basham, Michael Doyle, Bob Harris, Michael Doyle, Jamie Murphy, Paul Coutts (sub Jason Holt, 46 mins), Matthew Done (sub Kieron Freeman, 81 mins), Mark McNulty (sub Louis Reed, 63 mins) Unused substitutes: Craig Alcock, George Willis,Che Adams, Dominic Calvert-Lewin. Goals: Posh - Payne (87 mins), Washington (90 + 1 min). Sheffield United - Done (65 mins). Cautions: Posh - Payne (foul), Vassell (unsportsmanlike conduct), Newell (foul).